In the above example i have imported “the Primstar” shape. 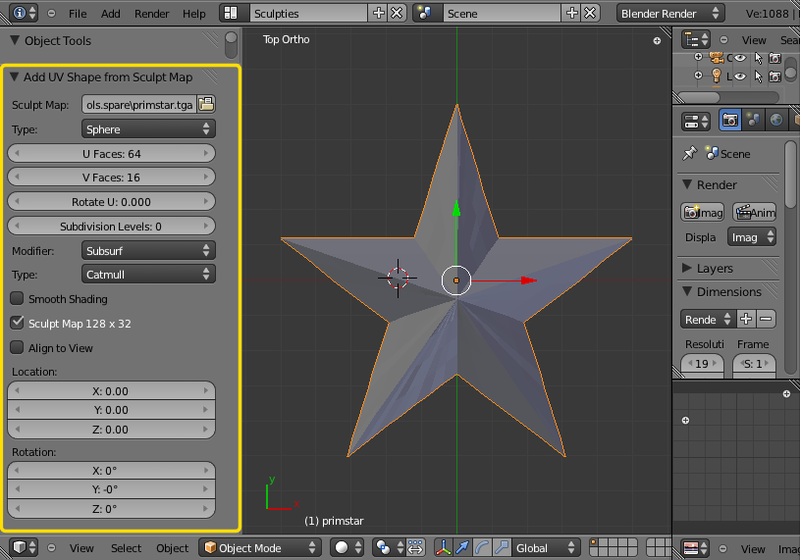 On the left side you find the “Add UV Shape from Sculptmap Panel. There you have full control over all sculptie parameters. The initial setting Will be carefully selected such that the Shape will be preserved. But you can setup your object for Multires or Subsurf and change the number of actually used faces, Rotate the Seams, … In the following i only describe the specific parameters available in this panel. For a full description of the other available parameters see the “Creation” Chapter further up in this document. This is the path to the file from where the Sculptmap has been imported. Note that you can change this path if you have chosen the wrong file and want to correct that now.